When I moved last September, before I knew what neighborhood I wanted to live in, before I knew what type of building I was looking for, I knew one thing… my new place was going to have a photo gallery wall. The photo above is the result of hoarding frames (mostly from Pottery Barn, Target, & Michael’s) for months before my move, and scouring both the internet and my iphoto albums for the perfect images to display. Voila! Now these obviously are not the only two options when creating a gallery wall, however for someone who has never created one before (like me) it seems to be the most fool proof method for an aesthetically pleasing result. After planning a color scheme comes the stressful part: the layout. When searching images online for layout ideas my eye was drawn to the galleries which appeared balanced off a horizontal line- so that became the method to my madness. Before putting any marks up or nails in the wall play around with your design on the floor. My layout changed several times before I started hanging anything. Once you’re happy with a layout- break out the hammer and nails! Remember to save up your patience for the hanging stage, and take your time to do it right. It took me and my boyfriend at least a couple hours (not to mention a few four letter words) to hang all the frames, but now we have a beautiful wall featuring some of our favorite memories to look at everyday- well worth it! I love your wall, and those pillows! Where did you find them? Thank you! Also, thank you for being our first comment- we’re just getting started here! Those pillows are from Johnathan Adler. They were a bit of a splurge for me, but they’re now among my favorite things in my apartment. They have great texture up close, and the flip side is a negative version of the black/white on the front. Adorable! Welcome to the blog world! I was thinking they might be Jonathan Adler, I love his stuff! My initials are A.P. so that definitely helped catch my eye. Looking forward to more posts soon!! Beautiful, and I especially love the images that you have selected! Thank you so much! It was so much fun to select them, and it will be fun to change them in the future. Thanks for reading! Nice post. On the old show “Trading Spaces” I think it was Vern, said make a paper template put it on the floor like you illustrated the place template on the wall and put your nails in. I tried just doing 4 without doing it that way and it was difficult. Your room is really cute. Thank you! That’s a great tip! Thanks for sharing. 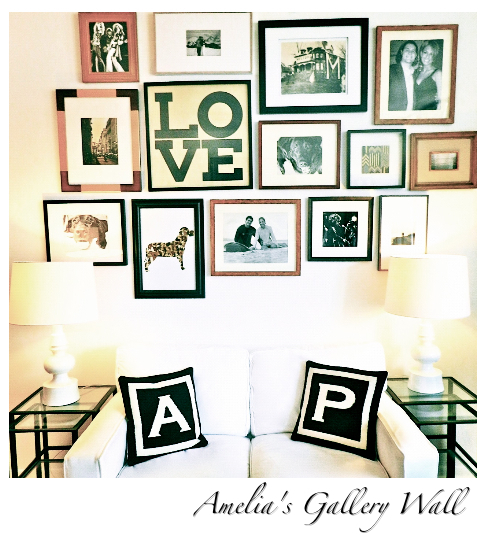 I have a gallery wall plan in the works as well! Great to see how you put yours together, and I love the other inspiration ideas! Thanks! Great gallery wall! Where did you find the LOVE print?